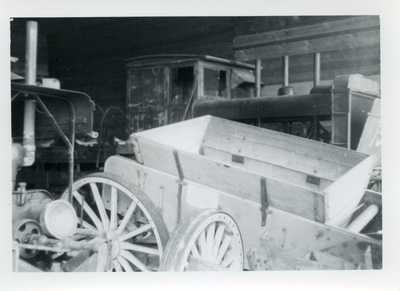 "Photograph of a Wagon "
A black and white photograph of a wagon next to an old automobile in a garage. Handwriting on the back of the photograph appears to say, "Watson Wagon, Churchill Storeshouse." From the Ralph J. Sawyer section of the Harris W. Soule papers. Saved near other photographs dated 1938.